Corten and stainless steel vineyard and winery signs are being installed throughout the Eola-Amity Hills AVA. This is part of a multi-facetted project to upgrade the visibility of, and encourage visitors, to the Eola-Amity Hills winegrowing region. The improved signage will include at least four similar but larger signs at or near the major entry roads to the AVA, in Polk and Yamhill Counties. “Welcome to Amity, Gateway to the Eola-Amity Hills” signs are also under development in cooperation with the city of Amity. Further, the Eola-Amity Hills Winegrowers Association is updating its printed and on-line guide to the Eola-Amity Hills AVA. Major funding to design, fabricate, place and maintain the entry signs was provided by Travel Oregon through the Oregon Wine Country Plates Matching Grants program. The $20,000 matching grant was fully matched by voluntary contributions from 31 members of the Eola-Amity Hills Winegrowers Association (donors are listed on this page). Vineyard and winery members also committed to purchase their own signs. 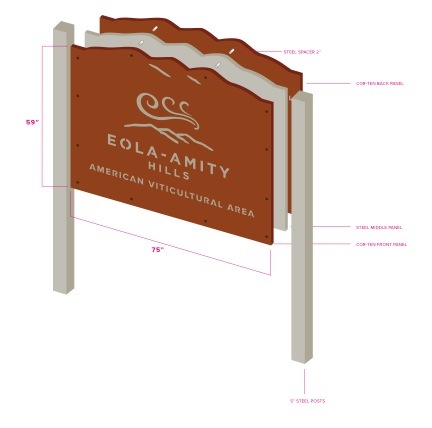 All signs feature the logo adopted by the Eola-Amity Hills Winegrowers Association, with mountains and winds as well as the words “Eola-Amity Hills.” Individual signs may also have smaller appended panels with the business name and sustainability certification. The corten on the new signs will weather to deep, dark rust, similar to the color of the volcanic soils characteristic of the Eola-Amity Hills AVA. Over two dozen signs are in the first order. Travel Oregon, the Oregon Tourism Commission, made its first Wine & Culinary Tourism grants from money generated by sale of Oregon Wine Country license plates in the fall of 2015. The projects are to be completed by September 2016. Through the Oregon Wine Country Plates Matching Grants Program, Travel Oregon seeks to advance wine and culinary tourism projects to improve local economies and communities through tourism. The Eola-Amity Hills American Viticultural Area (AVA), located in Polk and Yamhill Counties, is one of Oregon’s unique wine growing areas, approved by the United States Department of Treasury, Alcohol and Tobacco Tax and Trade Bureau in 2006. The Eola-Amity Hills Winegrowers Association was established in 2008 to promote and advance the AVA, its grapes, wines and visitor experiences. Among the initial goals was developing signage for wineries and vineyards. The Association now has 100+ members including wineries, vineyards and supportive local businesses.